This post is a travelguide about the best things to do in Kosovo with a one week Kosovo itinerary for the independent budget traveller. Kosovo is a great country so before I get into the top things to do in Kosovo and share my one week Kosovo itinerary, let me explain why it is the perfect destination for backpackers. Backpacking Kosovo is a rewarding experience. Kosovo is an incredible diverse country with plenty to offer from charming towns, to spectacular mountains and old monasteries. Kosovo is not only beautiful, but people are also extremely friendly and will make your stay memorable. For backpackers Kosovo is an easy country to travel around in. There are frequent buses between the major cities and because it is also one of the cheapest countries in Europe taking a taxi to more remote places will still fit within a backpackers budget. There are so many things to do in Kosovo that you will likely underestimate the time you need for your Kosovo itinerary. It is possible to visit Kosovo in a few days, but a week is much better to fully appreciate the country and even then it is easy to stay much longer, especially if you want to do some hiking or learn more about its history. Kosovo is Europe’s newest country and in my opinion also one of the most fascinating ones. It’s been ten years since Kosovo declared its independence from Serbia in 2008. I wish I could write how well Kosovo has been doing since then, but things are not that simple. The war might be over, but migration, unemployment, mixed international recognition, unresolved war crimes and tensions between the Serbs and Albanians remain. Still, the young nation where 53% of the population is under the age of 25 is proud of its independence and hopeful for a better future. And there is no reason to believe that with this youthful spirit the country can not progress and overcome it’s challenges. Despite it’s problems, Kosovo is safe for travellers and is welcoming visitors with open arms. There is an impressive amount of things to do in Kosovo for its small size and where else can you witness history in the making first hand? With so many things to do in Kosovo you should go now before others discovered Kosovo too. In my latest trip to the Balkans I made sure to include Kosovo in my Balkan itinerary, but was not sure what to expect. It turned out to be one of the highlights of my trip throughout the Balkans. I really loved Kosovo for all it has to offer. In this post I will share my one week Kosovo itinerary with the best things to do in Kosovo for the independent budget traveller. 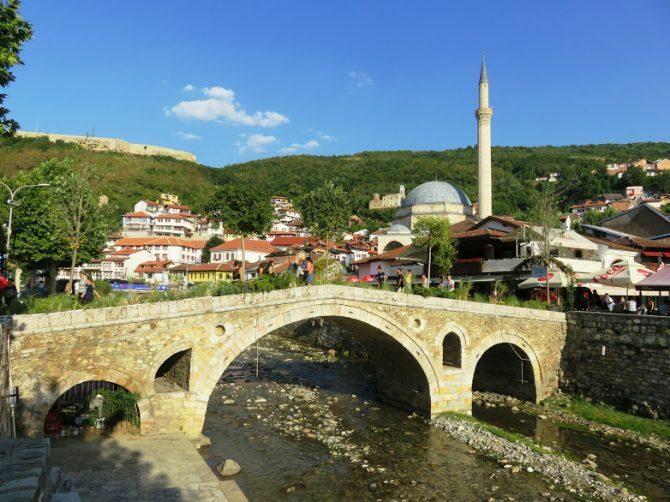 I visited the pleasant cities of Peja, Gjakova, Prizren and Pristina and went on a range of exciting daytrips to Kosovo’s incredible nature and old monasteries. There were so many things to do in Kosovo that I was barely able to do everything I wanted in my one week Kosovo itinerary. My journey started in Albania where I took a minibus from Valbona to Gjakova in Kosovo. Surprisingly, the border was one of the easiest border crossings of my trip in the Balkans. As we pass by several villages a young girl next to me informs me that this area, with mostly Kosovar Albanians like herself, was heavily affected by the war and a large number of people that lived here fled to Albania or Europe. Still fearing the Serbs, those that returned rebuilt their homes close together in clusters rather than return to their old homes that were interspersed with large farmlands in between. My first stop in Kosovo was the small town of Gjakova with the oldest and longest bazaar in Kosovo. The town’s old bazaar was destroyed during the war in 1999, but has now been renovated in its original state. The atmosphere is friendly and relaxed and there are plenty of young people willing to talk about their city. Gjakova is one of the best places to visit in Kosovo for those that love food. Gjakovars are said to make some of the best meat and Kosovar recipies in the country. The amount of cafes and local restaurants certainly live up to that name. It makes a great lunch stop en route between Prizren and Peja (both 1 hr away). Logistics: Buses to Prizren, Peja and Pristina (1 – 1.5 hours) leave almost every hour during the day. To go to Valbona in Albania you can take a mini bus to Bajram Curri (Albania) and from there to Valbona. Did I already say that Kosovars are friendly people and very happy to talk to foreigners? I was looking for the station in Gjakova for the bus to Peja when a taxi driver decided to help me out. He didn’t bring me to the station, but parked his car right in front of the bus that had already left and was just passing by. My next stop was the friendly city of Peja. The cosy old town of Peja brings you right back to Ottoman times with its lively bazaar and old mosques. But this is not the main reason to include Peja in your Kosovo itineray. Peja offers the best things to do in Kosovo for nature lovers and is the gateway to Kosovo’s accursed mountains. They are full with scenic hiking trails such as the Peak of the Balkans trail and the long distance hiking trail of the Via Dinarica. Logistics: Buses to Prizren and Pristina (2-3 hours) leave almost every hour during the day. Nearby Rugova canyon is the deepest and longest canyon in Europe. It is an eaay daytrip from Peja and one of the most spectacular things to do in Kosovo. Through my hotel I booked a taxi. Something that is normally out of my budget, but in Kosovo still a reasonable option. It was not far to the actual canyon where we stopped to take some pictures. We then moved on to Prokletije national park. Part of the Accursed Mountains covering Albania, Montenegro and Kosovo. This is hiking in Europe off the beaten path through wild nature where bears and wolves still roam. We continued till the end of the road to a village called Kuqishtë. From here you can hike to Leqinat Lake. Unfortunately I did not have the time to do so, but at Floating my Boat you will find a well written blog post about this trek. A dirt road goes further till the mountain village of Bogë from where I did some small hikes to enjoy the views over the meadows and forests. Logistics: It’s probably best to hire a taxi, but there are 1 or 2 public buses a day from Peja to Bogë. At the entrance of the Rugova canyon lies the patriarchate of Pec. One of the most important medieval monuments in Kosovo and the center of the Serbian church. It’s secluded location adds to its tranquility. The pleasant gardens and beatiful frescoes make it a must see. Because it lies at the entrance of the Rugova canyon it is easily combined with a daytrip to Rugova. Otherwise it is a nice 15 minute walk from the centre of Peja. Decani is easy to visit from Peja. The monastery of Decani in Kosovo is not without controversy. The monks belong to one of the oldest dioceses of the Serbian orthodox church and it was built by a Serbian king in the mid 14th century. Therefore, the monastery is of great importance for Serbia that does not recognize Kosovo’s independence. Kosovar Albanians have showed their discontent about the monastery multiple times. Because of the continuing tensions it is on UNESCO’s World Heritage in danger list. The monastery is still guarded by KFOR UN soldiers although things have calmed down in recent years. My taxi first passes through a checkpoint way before I see the barbed wired walls of the monastery. To get in I had to show my passport and received a special visitor pass. The interior of the church is full of wonderful fresco’s and well worth the time and effort. Logistics: Hire a taxi or take a bus from Peja to Decani and walk 2 kilometers to the church. You could also stop here on your way from Peja to Prizren. Prizren was my favourite place to visit in Kosovo and a city that should be included in every Kosovo itinerary. It reminded me a bit of Sarajevo in Bosnia, because of its strong Ottoman influences and its multicultural nature with the different houses of faith that dot the landscape. Mosques stand alongside Catholic and Orthodox churches. At the bazaar you might forget you are still in Europe as it has a unique Eastern atmosphere. Unfortunately, unlike Sarajevo, tensions between the different groups are still more tangible. The old Serbian churches are guarded after several attacks and attempts to burn them down. Its hard to reconcile this with the warmth and hospitality of this city. Prizren is not a big town and it is easy to see everything in one day, but the friendly vibe might keep you longer. The city is best explored on foot and I used this self guided walking tour from Jetsetting Fools. It will pass by most important sights such as the sinan pasa mosque, the old hamam and the church of our lady Ljevis. It was summer and many Kosovars from Europe came back for holidays or weddings. We saw several wedding couples and the shops were full with extravagant wedding dresses and traditional Albanian costumes. Needless to say it was a joy to wander around Prizrens streets. For the best views on the city and the best sunset finish your day with a walk up the Prizren fortress. Logistics: Buses to Peja and Pristina (1 – 2 hours) leave frequently from the bus station. Prizren also offers some exciting daytrips in the surrounding mountains. We liked Prizren so much that we spent all our time in the city, but the Kosovo itinerary of wanderlustingk mentions some interesting options. Pristina is Kosovo’s young capital. Maybe i was spoiled by the old towns of Gjakova, Peja and Prizren, but Pristina wasn’t my favourite place to visit in Kosovo. It missed the personalities that made the other cities welcoming and charming. We did come accross some quirky architecture and street art in the city and there are a few nice things to do. In one afternoon we walked around to see the bill clinton statue, the newborn monument, the unfinished serbian orthodox church and the brutalist structure that is now the library. With the summerheat most people stayed indoors during the day and it was sometimes eerily quiet on the streets. It was only at night when the Nena Thereza boulevard became alive. With some great places to eat we spent our evenings here dining on Kosovar delicacies. On my second day I was not sure what to do. I already saw everything that was in our guidebook, So I decided to visit the local market in the older part of town near the clocktower. The colourful and lively bazaar selling fresh fruits and vegetables was the first place in Pristina where I felt Kosovo’s unique atmosphere. The mix of Turkish and Eastern European Balkan vibes. Even though the bazaar is not as beautiful as the other old towns this is the best thing to do in Pristina. To end with a positive note. Pristina is full with some really nice and hip cafe’s. I spent considerable time in Soma’s book station. The combination of books, great food and healthy smoothies always does well with me. Kosovo has great coffee too and other great cafes are Dit e nat, Liburnia, Che bar and Prince coffee house. I honestly did not see Gracanica monastery because its beautiful frescoes were in the process of being renovated while I was there (august 2017), but hopefully this will be finished by the time you read this. It is just 8 kilometers from Pristina and it is an easy 15 minute busride away. The Giljan bound buses leave every 30 minutes. Kosovo’s restaurants offer huge portions of delicious meals. Trying Kosovar food is one of the best things to do in Kosovo. Kosovar cuisine is influenced by both Turkish and Balkan food. This means a lot of meat and fresh salads. The plentiful kebaptore provide grilled meats for little money and are some of the best places to go for a quick and cheap lunch. Other dishes worth trying in the local restaurants are stuffed peppers, sarma (grape leaves filled with minced meat) and different types of bean stews. The summer brings heaps of fresh watermelons that are a welcome respite from the heat. I already mentioned that Kosovo is cheap. There are great affordable hotels in Peja, Gjakova, Prizren and Pristina and some great options with Airbnb. Hostels are also coming up in the main cities. Because I used Air bnb I havent stayed in the hostels below, but they have good reviews from other travellers. Winters can get very cold in Kosovo. Snow and fog will make it difficult to travel around. However, the Rugova mountains are a good place for wintersports. The village of Böge at the end of the road from Peja to the Rugova valley is a ski resort in winter with plenty of things to do for the adventurous traveller. In the summer it can be very hot in the cities and a lot of Kosovars in the diaspora return to Kosovo. Expect to see many cars from Germany and Switzerland. Wedding season is in full swing and these are a big deal in Kosovo. Shops are full with bridal dresses and you will probably encounter wedding parties here and there. Summer might be warm, but this is also the perfect time to visit Kosovo’s mountains. Kosovo is becoming increasingly more popular as a destination for hikers. Trails are being developed as we speak such as the cross border hiking paths along the Peak of the Balkans trail and the Via Dinarica. How safe is it to visit Kosovo? Before I went to Kosovo I got quite some questions whether Kosovo was not dangerous. People still associate Kosovo with war and ethnic violence. I can remember the images on the media myself of refugees fleeing from the country. But this was ten years ago and as I said before the country is now building a new and better future. Kosovo is absolutely safe to visit. Even though there might still be tensions between the different ethnic groups you are not likely to encounter any problems as a tourist. These tensions, though visible at times in guarded Serbian monasteries, were hard to reconcile with the friendly people I met in Kosovo. Not once did I feel my safety was at risk. Besides the common precautions you need to take as a traveller in any country there are a few things to take note of in Kosovo. The first thing is that sometimes things can escalate. This is rare, but it helps to keep up to date with the local news. If you want to visit a place that you are not sure of ask the local people about the situation. Second is that you might have your own opinion about Kosovo, but it is better to stay away from political discussions. Keeping those things in mind you will have a wonderful and safe time in Kosovo. As a solo female traveler I experienced no problems in Kosovo. Kosovo is a muslim country, but that is easy to forget when you travel there. Religious life happens mostly at home and for example, head scarves are rare in public. The occasional male attention you might get is easy to deal with. For me walking in Pristina did not feel very different from walking in any other European capital. In general people are very friendly and happy to see tourists in their country. Kosovo has frequent bus connections between its cities and with the neighbouring countries Albania, Montenegro, Macedonia and Serbia. Travelling to and in Kosovo is easy and convenient. Serbia still does not recognize Kosovo. This means that you can travel from Serbia into Kosovo and back into Serbia (for Serbia you simply haven’t left the country), but not enter Kosovo from a different country and then travel directly to Serbia. Complicated isn’t it! Luckily distances are not that big. From Pristina we first travelled to Skopje in Macedonia and then took a bus to Nis in Serbia. The other option is to go through Montenegro. There are frequent buses between Peja, Prizren and Pristina and other major cities in Kosovo. Public transport into the mountains and other off the beaten path places in Kosovo is more limited, but taxi’s are not that expensive. Ellis is a travelblogger from the Netherlands with over 20 years of experience as an independent budget traveller in more than 50 countries. She has a Master degree in Cultural Anthropology and Global Health with a specialization in South Asian cultures and the Caucasus. I absolutely loved my time in Kosovo. It’s a fascinating place and it’s so easily accessible to tourists. I hope that more people experience it for themselves rather than making assumptions! Nice post. Would love to see the Street art in Kosove. Helpful info. I have not been to Kosovo yet, so it is interesting to learn about this country. Thanks for your detailed information and practical tips. I love following you on your backpacking adventures. Interesting post on Kosovo. Love the street art in Pristina. And, the canyons and mountains. Balkans! I can’t wait to go back. Great info I have saved for reference. What an experience! I’d really like to spend more time exploring the eastern half of Europe. Sounds like a fascinating experience. Lovely scenery and architecture too. A really interesting read, the food and scenery look wonderful. It’s very sad that it’s still a troubled country. I love you included the Monastery! Kosovo will definitely have to be on my bucket list. I especially love learning about the history of a place and this post definitely inspired me! Thank you!